Product Description: This is for the supply and fitment of the VW bluetooth phone kit. Only genuine VW parts are used in the installation of this product. The work can be done on a call out basis however this may be subject to a call out fee. All parts are Brand New and come with a 2 year warranty. This is the very latest Genuine Bluetooth Kit available from Vw. It works very well with all the latest phones and will also support A2DP High quality Stereo Bluetooth Audio Streaming as well and voice control. 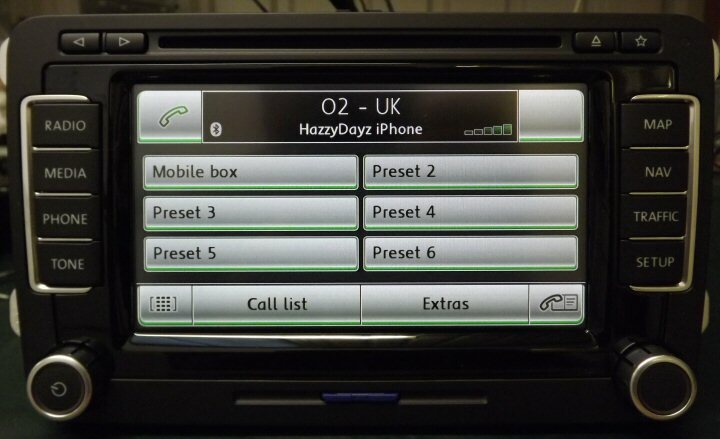 Note: A2DP requires suitable headunit as well as suitable mobile phone such as iPhone to operate. Please note: Vehicles with the RNS-510 or RNS-810 may require a firmware update to allow the Bluetooth Audio Streaming to operate correctly. This is not included in the Bluetooth installation price. We can offer the firmware update for a special price of £50 + VAT extra if done at the same time. This tends to effect pre 2010 model years. Note: Vehicles with the early RNS-315 and RCD-510's fitted may not function correctly with the Bluetooth Audio Streaming function. Unfortunately there is no way to upgrade the firmware on these units. 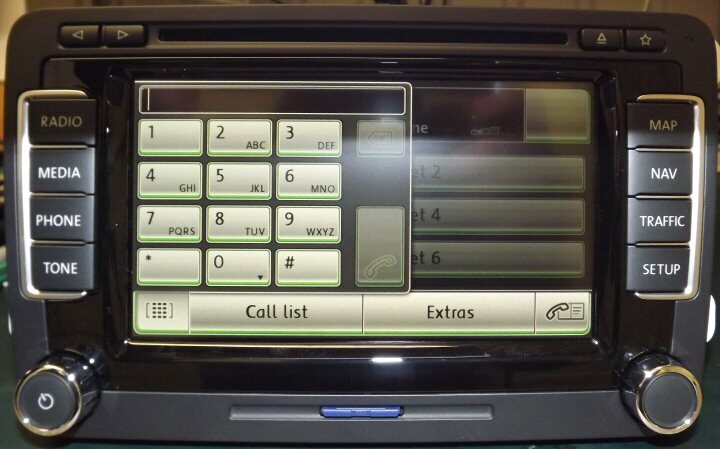 Compatible Headunits for telephone display on radio screen. For operation through radio display please see demo video below. Note: The RNS-310 will only display the telephone on the touch screen if manufatured after 2011 with software index 0351 or later. Compatible Instrument Cluster for telephone display on DIS. - Colour DIS 2009>. Phaeton 3D and Touareg 7L require premium kit for this display, please advise sales team if this is required. * Please note : Touareg 7L with RNS-510 will only support A2DP bluetooth Audio streaming after firmware update, however updating the firmware on this model causing a glitch with the Genuine Reverse Camera, where you need to manually cancel reverse camera display on screen after first switch otherwise it will not switch again until ignition is reset. 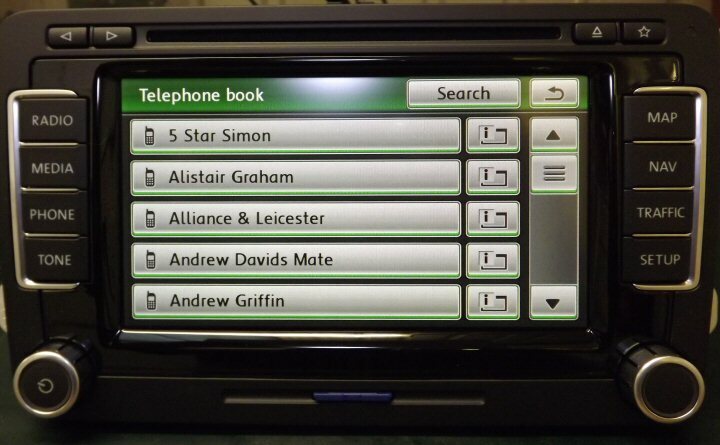 Note: The Red Driver Information System fitted to models up to 2010 doesn't support the Telephone display or operation. This also applies to the MFSW control for telephone on models with red DIS factory fitted. On these earlier models with Red DIS and MFSW factory fitted, we can upgrade the Steering Wheel Control unit to allow the Telephone Answer/Hangup to operate. If required please select this in the options below. However full telephone operations on these models can be controlled through the headunit. 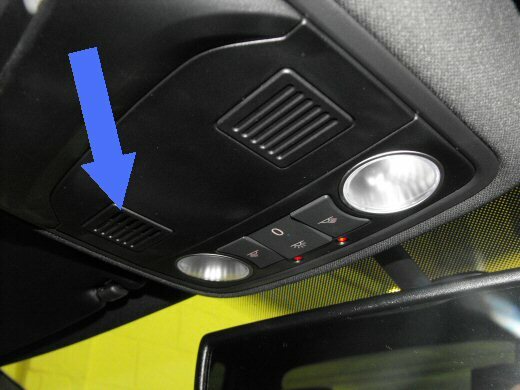 Above: Vw Bluetooth Kit displaying telephone book. 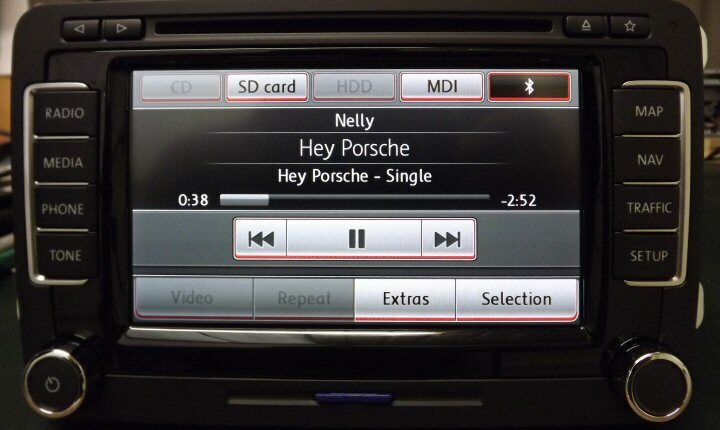 Above: Genuine Vw Bluetooth Kit fitted to RNS-510 Headunit. Above: The Microphone is fitted in the factory fitted position behind small grille. Above: Bluetooth Audio Streaming with txt display and skip track. Above: Genuine Vw Bluetooth Kit Through Radio Display.